Tell Us Your Scooter Stories! Share Your Scooter Adventures with Us! When you love scooters, motor scooter stories will naturally follow. So please entertain all of us by sharing your stories of your scooter adventures! Sure, scootin' makes great sense during our economic crisis and in the era of skyrocketing gas prices. It's cost effective, fuel efficient and green-thinking, right? But, c'mon... you have to admit that at least one of the reasons you bought your scooter was because you thought it would be fun. I'm not wrong, am I? So, I thought it would also be fun to put up a page where anyone could share their motor scooter stories... they could be scooter adventures, funny things that happened while on a scooter, etc. Totally up to you. Please keep it clean, though... this is a family site! If you'd like to share a general scooter story, use the form below. It might take me a day or two to review your submission, but I'll get it up there eventually. I've also set up a "specialty" story page about motor scooter modifications. While I appreciate your willingness to share your stories here, I do have to require that you use use proper capitalization & punctuation when you type it. Please... no ALL CAPS! If you are not willing to do so, then I WILL delete your story! I'm sorry to be so inflexible, but... I just don't have time to do heavy editing and I won't publish ALL CAPS, all lower case, no spell checked or no punctuation submissions. No exceptions. So don't waste your time or mine in typing in such dreck, OK? Thanks for your cooperation! Have A Great Story About Scootin'? Do you have a great story about a scooter adventure you have experienced? Or maybe you want to tell us how you came to acquire a scooter? Whatever you feel like sharing... We'd love to hear it! And it's so easy to do... just use the simple form below and you'll be on your way. Entering your scooter story is easy to do. Just start typing (but remember to use proper capitalization and punctuation and proofread for typos). 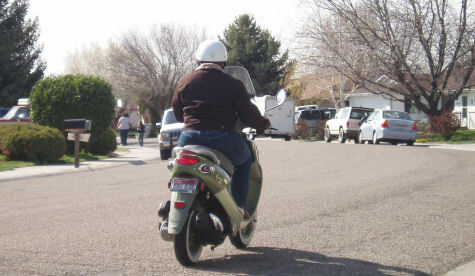 Your scooter story will appear on a Web page exactly the way you enter it here. You can wrap a word in square brackets to make it appear bold. For example [my story] would show as my story on the Web page containing your story. Do you have some pictures that would add to your story or help bring it to life? Great! Click the button and find the first one on your computer. Then select it. Then, rinse and repeat for up to 3 more pictures. It's all good! My - I Mean My Wife's New Yamaha Vino Scooter... Oops! Heck’s Angels... or The Blue Hairs Are Coming, The Blue Hairs Are Coming! And thanks... I'm looking forward to reading your stories!